Thank you, Mighty God, for bringing justice to our nation. Please give us the gift of intercession for all involved. Amen. I heard some news from Carol about those who are testifying now about the corruption in the government, and my heart began to pray. Soon after I finished the Lord's Supper, Jesus began to speak. "Yes, there are intrigues and corruption going on now even as we speak. I ask you, My people, unite your prayers with My mother's for your nation. Her prayers are quite invisible to you but resound to the high Heavens for your nation. She is putting out a constant stream of prayers for all involved, and when you pray with her, it becomes even more powerful. "Why do you resist Me, you stubborn ones? Your hearts are set on the religious spirits of your day. Those who have closed off the wellspring of grace from My Supper, My mother and the Great Cloud. Do you want to continue in this kind of ignorance? Or will you come to Me without poison and self-righteousness in your hearts and receive what I have given you in the Scriptures to increase your effectiveness on Earth. "I am tired of hearing that this Vessel is deceived. What has happened to the Truth you've borne witness to for many years? Nothing in her has changed--it is you who have changed, because your false beliefs were challenged. "I have come to deliver you from the straight-jacket of religion... and you insist on keeping it. Very well, then. I will leave you in your straight-jackets until you grow hungry for the Truth. Search the Scriptures, NOT the internet, to understand what I have given you. If you continually rely on men's opinions, you will live men's religion--and not Mine. "For those of you who have embraced these Truths, I want to move on. I want you to have all that you need to operate in freedom and power through My Spirit living in you. You have done well. You have been faithful. You have grown and tasted the sweet fruits of Truths hidden away long ago by ignorant men. They are yours now and you are better equipped for the battle. Doesn't this give you great joy? Can't you feel the freedom of Truth operating through you? "Despite this country's intrigues, I am still with her. She has chosen to follow Me, and therefore, I strengthen her. She will emerge from the Tribulation with a glorious scepter in her hand and will rule with equity over many nations. You have seen the darkness encroaching and taking over this nation. Now you will see the triumph of the Light. This is not an easy path--there is loss, pain, and suffering for those who uphold the Truth. "But even as I suffered, in the end, the glory of My Father has shone upon you. The whole world is watching you, America. The whole world has seen the slain innocents as well as the punishment that was due those betrayers. This could not happen if you were under the previous administration. In that one, misdeeds passed by unnoticed, unpunished, and unspoken--even as though they didn't exist. "And isn't that the way to silence the voices of Truth? Silence them and promote the evil-doers. Yet this life is very short, and for a pittance a man sells his soul to Satan, not recognizing his eternal consequences. You who have been party to this degradation, it is not too late. You may return to Me and testify of these misdeeds and you will save your soul. Or, you may continue to cover the misdeeds and blame them on the innocent. Your eternity is standing before you. "What will you choose? Do you think Satan has glory stored up for you? How can you put your trust in one whose operations among mankind are based on lies? Can any truth come forth from this sewer? Indeed, this will be your portion unless you repent. "But for those who have responded in prayer and fasting according to their ability, I say to you, 'Bravo! You have done well.' Continue now in this posture. Keep your heart free from the cares of this world during this season that has long brought shame upon My Birth. Celebrate with moderation, integrity, and extreme devotion to Me and what My Incarnation brought forth to free you from your sins. "Be tender with Me, My people. My Father and I suffer terribly during this time. Not only from the indifference to the true meaning of Christmas, but also to the atrocities committed during a season committed to lust and violence to the trafficked children of this world. Pray for them!! Oh, do pray for them!! How they suffer. Adopt them spiritually into your hearts and comfort them. This is the greatest gift you could present to Me at My birth: the lives of innocent children, comforted and consoled. "You ask, 'And how do I go about that?' Ask My mother to present them to you in the Spirit and then take them into your embrace. As you live day to day, offer your inconveniences, sicknesses, and disappointments for them. When you are permitted to see them, comfort them on your heart and speak words of eternal hope to them. This will please Me endlessly. And see if I do not make this the best Christmas yet, of all your life. "I bless you now, My people. You who have faltered along the way, may you receive courage. My courage. You who have followed in My footsteps faithfully, receive the increase of love and anointing I am shedding upon your lives and even those in your families. Continue to walk with Me. Comfort Me and My Father. "Comfort, yes, comfort. For we see the things you do not have to see. Comfort Us with your love. It means so very much to Me." And some of you might ask, "Well, how do we comfort God?" With our love. Go into Dwelling Prayer. Go into Dwelling Prayer, picking a few songs. Let the Holy Spirit choose. We put the entire playlist - I've got one for 8 hours long - on shuffle. And He picks different songs. When you feel connected with the Lord, then turn the music off and just hold Him in your arms. Or hold these little children in your arms. And stroke His hair in the spirit. And comfort Him. He's so, so longs for your comfort. And that is another thing that has been hidden from Christians. The fact that they can actually comfort God in His sufferings. But don't let those false arguments stop you. Embrace Him. Tell Him how much you love Him. Stroke His hair. Cry with Him. Hold Him to your heart and tell Him how sorry you are for your sins and the sins of humanity. There is a sweetness to be had in this place, dear ones. A great sweetness when we unite ourselves to God. Not only in His joy, but also in His suffering. Ask Him to bring you into that place. Go to that place and spend time with Him there. The Lord bless you all, dear Family. Thank you so much for being faithful and following us over to Vimeo. And continuing to support the mission. I can't tell you how much that means to me. God bless you for that! We are so, so gratified to see how generous and kind all of you are. Thank you so much. May the Lord bless you abundantly during this season. And may you hold the Infant Jesus in your own arms, for Him to rest and find comfort with you. And to that end, we have a baby Jesus that we wrap in swaddling clothes. And we hold our baby Jesus and sing Christmas songs to Him. And it's kind of a private devotion. 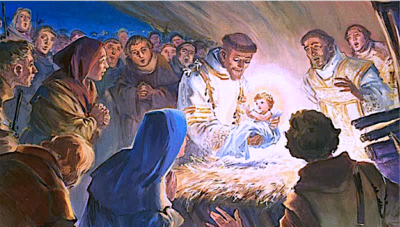 Different ones of us will take the Child, the baby Jesus, into our arms and go into prayer with Him. And I'll tell you--that is a very sweet, sweet experience that you don't want to miss during the Christmas season! And it comes from the monks. Cloistered monks who spend time in prayer continually. That's a tradition among them to have a baby Jesus to comfort. And they pass the baby Jesus around the monastery, to the different monks that are in different cells. Beautiful devotion... Just beautiful. What a tradition. So, enjoy your Christmas. Enjoy it with the love of God. And know that He is eternally grateful for every bit of affection you show to Him.